So you need to run Internet Explorer on your Mac and you don’t want to bother with a full Windows install in something like Parallels. What are you left with? Update: You can download Internet Explorer and Windows virtual machines for free that run within Mac OS X. That method works for IE7, IE 8, and IE9, although they run within a VM rather than as an app like the below method. Try WineBottler, it runs off of Wine and ‘bottles’ various Windows apps into launchable .app files that sit in your Applications folder like any other Mac app. There’s several packages included in WineBottler but the ones you are interested in using are Internet Explorer. Downloading Internet Explorer for Mac directly can be done with IE5, but as we mention below Microsoft stopped supporting it officially after this version. Later versions of Internet Explorer can be downloaded and run through the WineBottler app within Mac OS X, the instructions below will walk you through this process with versions 6, 7, and 8. * Wait a few moments while IE6 gets installed, you may be asked about installing DCOM98.EXE from Microsoft, which is a required part of IE. This goes through Wine. * You are now running Internet Explorer 6 on your Mac! * Installation and setup instructions are the same as above but click on “Internet Explorer 7 or 8” in the package installer. See screenshot below for installation reference. If you are looking to install Internet Explorer 7 or 8 be aware that the developer of WineBottler warns both IE7 and IE8 are not particularly stable. I can confirm this, both crashed during testing the app but IE8 was particularly problematic. If you want to run Internet Explorer 7 or 8 in Mac OS I’d highly recommend just installing Parallels, VirtualBox, or VMWare with Windows, it’ll be far more stable. You can download WineBottler from the developer. What about Internet Explorer 5? 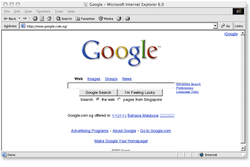 IE 5.2.3 was the last supported and released version of Internet Explorer by Microsoft for Mac OS. You can get Internet Explorer 5.2.3 for Mac OS X if you are interested in running this older version. Why would you run Internet Explorer in Mac OS X? Well, there’s a bunch of reasons you’d want to use IE on your Mac, but most are developers looking to insure cross-platform and cross-platform compatibility. Again, if you are looking to use IE6, IE7, or IE8 frequently in Mac OS X, it’s probably best to use something like Parallels, VMWare, or VirtualBox. I am partial to VirtualBox because it is a free download. In this case you will need to have a Windows install within the virtualization software to be able to run Internet Explorer on top of Mac OS X. In my WineBottler, it doesn’t say unstable anymore, so I’m assuming it’s ok now. Hi thx for the tipp that’s exactly what i’m looking for. But the reason i write is…i have a problem..
someone an idea what might be wrong ? After attempting to download Internet Explorer 6, I got a debugging log and the following error: Prefix creation exited with error. In result, no Internet Explorer for me. Help? I got the same response as Meghan. “Prefix creation exited with error” message and a debugging log. Winebottler does not work as advertised. Don’t bother with the download. Waste of your time! Try reading into the problem first before you completely give up. You need to install X11 first, then it will work. Same problem as Bob. What is X11? The easiest way to get X11 is to install Developer Tools which are on your Mac OS X installer CD. It’s free. So, go to http://www.x.org/wiki/ and install X11R7.5. ? No idea what this is, I’m not a developer. X11 comes with the Xcode package. If you have the installer disk that came with your Mac, you can install XCode from there. You’ll need to create an Apple login, which is free. Further to your comment about X11 resolving the error code issue described when trying to install ie6 via WineBottler, I have X11 but dont know what I need to do with it to get WineBottler to work? Can you advise? I applied in the small hours of this morning. I can get the localhost working, but all sub-domains won’t work on parallels. But either way ultimately if I can a go on ie4mac this might mean I don’t need to use the VM (Hurrah!). One less thing to worry about with Drupal and I can focus on getting on with cross browser testing. Do you know if ie4mac does anything sensible like, renders text via a Windows emulator? As Text renders differently on Windows than on OSx – not a big problem unless your trying to get clever and use the @FontFace Attribute. Either way very keen to try out the IE6,7,8,9 stuff. Consider me a future customer if you can help. I just tried it and installed IE8. Unfortunately, there is only only window showing something like IE8 and in the tab it says “Connecting…”. Entering a URL does not change anything. But at least the concept is great and the icons are fantastic!! bzero: Same issue here. The installation was fine, however, IE 8 will only say connecting, and I have to force quit to close the window. Any ideas? Like a couple of people mentioned before, I too need to access school and work websites that only support IE – please help. Avant and Winebottler only work on Intel machines. PowerPC looks like it’s stuck with IE 5 still on OS9. The wars are over. IE lost. Move over for the new kids. IE didn’t lose because Microsoft has a monopoly on certain business programs. IE stinks, but some of us cannot use anything else. Bummer. IE6, 7, and 8 don’t work if you are trying to use winebottler. I wasted a few hours this morning trying to install and got the same problem other users are reporting: IE 7 or 8 (depending on which one you install) loads and says “connecting” but never actually connects to the web. Trying to type in a URL to force it to connect does not work either. IE6 crashes during the install process – doesn’t work either. Going to have to use parallels. Finding the same problems, and it’s frustrating to say the least. It seems to work for some, which is even more frustrating. I don’t want to reopen the Pandora’s box that is Windows, but I cannot avoid using IE because Microsoft powers my real estate search programs. So, having the same issue as a lot of others out there… Getting the “Prefix creation exited with error”. When looking at the log file I see the last line reporting “Task returned with status 15”. I have X11 installed, running 10.6.8 using the newest version of WineBottler 1.1.44. Anyone able to get IE6 to install at all? How’d you do it? I have the same problem then most of you guys, is there any other way beside wine bottler for IE? I had the same thing but figured it out.. I used the EI7, When you open it go straight to google using the top URL bar like normal. then do all your URLs through google. I had the connecting and freeze issue but it worked if i went through google. It was still useless for me though because it wont bring me to hotmail, and if i need to login to something, the login box is missing. Flash issue maybe??? Does anyone have a more consistent, modern solution to this? The only reason, really, to use IE on Mac is for testing, and none of the Winebottler installs are any good for this. They aren’t much more than a curiosity really. Check it out, it’s better than the Winebottler methods. X11 is on the install disc, not part of XCode. IE7 and 8 will not work in Wine or WineBottler without a *lot* of tinkering. IE6 works with great limitations. And as far as IE5 goes: it is so outdated that it won’t work with most modern websites. And, needing Rosetta, it will not function at all on Mac OS 10.7 Lion. I installed winebottler, its ok. I had the same problems described on this thread. i have X11. IE6 and 8 never installed correctly, and i have tried several times. IE7 runs well, but developing websites, it’s really annoying that it doesnt show jquery sliders…so i dont know if they show or not on IE, but as far as everything else (alignment, fonts, etc), its pretty helpful. i will keep it, but keep looking…and thanks everyone for the comments, makes us more informed and everyone learns. Was prompted to install some x11 program which is fine but nothing happens. Go into apps folder where I placed the download and it’s not their. Tried several times. I am admittedly not tech savvy, this wasted a lot of time.